Vietnam veterans once didn’t receive the best support when they returned home from war. Veteran Charles Perry said that when he first returned home from Vietnam, he didn’t get much of a welcome home. Perry was one of three soldiers rewarded by the Athens Quilts of Valor Group on their November 9 ceremony. 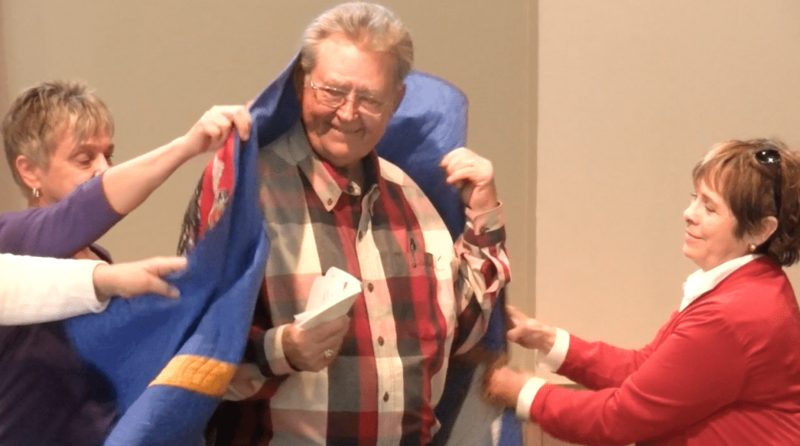 Veterans were given quilts to celebrate their service. World War II Veterans Howard Enter and Thomas Strickland were also awarded with quilts. All of the soldiers said that the quilts were very special to them. “With this special quilt, this has been my welcome home,” Perry said. Perry said he is always treated well by the community these days. Veterans Brian West and Jim Wood also share the same feeling. Brian West is the head of the Northeast Georgia chapter of the Military Order of the Purple Heart. Jim Wood is the head of the Athens Marine Corps League. Both men say that they’re constantly thanked for their service. “These days, it’s good to be a veteran,” West said. Wood and West try to offer support to other veterans by participating in the Military Order of the Purple Heart. This organization offers community and counseling to veterans who have been wounded in battle. “Being a veteran is about continuing to serve,” Wood said. Each man said that he receives more thanks than he could ever ask for. They all send their thanks to the community that often is thanking them. For more stories like this, visit our Facebook and Twitter.